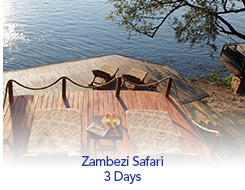 An opportunity to sample the thrill of safari in one of Africa’s most beautiful and game intense destinations. Breathtaking Victoria Falls provides a dramatic backdrop for game drives, walking safaris and boating excursions through the lush and lovely game reserves. Mosi-oa-Tunya National Park is situated along the upper Zambezi, stretching from Victoria Falls for about 7 miles upriver. The park provides a home for numerous antelope species, zebras, giraffes and white rhinos. Since there are no predators, the animals are very relaxed and afford some excellent photo opportunities. This safari affords the traveler an opportunity to see Victoria Falls, as well as enjoy a wildlife experience with game drives, walking safaris and boating excursions. You will have the opportunity to view game, such as zebras and wildebeests as well as a number of other species not readily encountered further south, such as puku, Defassa waterbucks, Lichtenstein’s hartebeests, oribi and roan.